Just a quickie post. I do have another post I need to do about my trip to the thrift store on Friday. 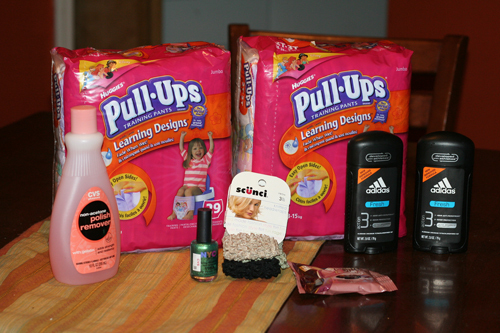 I went back to the $5 bag store and got tons of stuff in my bag this time! But I wanted to mention that Fashion Bug has their bras on sale buy 2 get 2 free! This is an awesome deal. It includes their clearance bras too. Most of the bras I looked at were about $16 each–so you could get 4 bras for $32, or about $8 each. I had a $10 off coupon so I got 4 bras for $24! (They told me that technically they were not suppose to use it on this particular sale but the manager let me because the coupon expired today!) So I got them for $6 each! Such a great deal! I love Fashion Bug because they have a nice large bra selection for the more voluptuos ladies out there!!!! 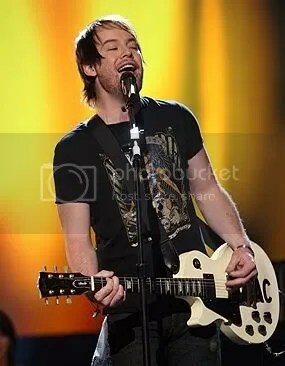 Congrats David Cook–the new American Idol! Finally . . . someone I voted for and followed and cheered on has WON! Woot woot! Can’t wait to see what happens in his career! He rocks! I mentioned in my previous post about my thrift store purchase this week. There is a thrift store in our area (if you live around here–Page One is located in Luray and in Shenandoah) that offers a $5 per bag special. Whatever you can fit in a bag is $5. And I’m not talking a little grocery bag. I’m talking a large kitchen trash bag. I know some people are funny about shopping in a thrift store. I have never felt that way. My feeling is that there is nothing a little detergent and hot water won’t kill. I always wash the clothes before wearing them and wipe down toys and other items with clorox wipes. (And of course there are some things that just shouldn’t be resold–underwear, bras, lingerie and bathing suits. I have to draw the line somewhere!). My mom used to drag me and my brother to the resale shops when we were little and my favorite part was always the book room. Tons of cheap books! The book area of thrift stores is still my favorite place. I found a Jodi Picoult book during my last thrift store excursion (my hands down, all time favorite author!) and it was only 75 cents! So I stopped at this little thrift store yesterday because I had some time to kill in between patients. I had to search a little more than usual but I was able to find some bargains. Here is what I got for a whopping $5.25! All for $5! I was excited to find Memoirs of a Geisha. If you have not seen that movie–you need to! We own it. I love it. Such a neat story. I was also happy to find Annagrace another tie dyed dress since she outgrew her one from the last 3 years! And that little light blue dress is like brand new. I don’t think it’s ever been worn–if it has that was one clean kid! 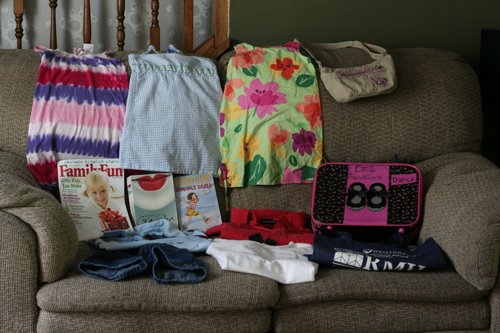 If I had bought all this at Goodwill–one of my other favorite places–it would have cost about $18! So that is a steal! If you notice over on the sidebar I have added a new set of links under “Let’s Go Green”. No, I’m not cheering for the Green Bay Packers. I’m cheering all of you on to “Go Green”! To learn more about our environment. To take better care of our earth. To not believe everything you are told about ‘friendly chemicals’ in our foods, beauty products, cleaning supplies, etc. I am still learning too and every day I learn something new. My latest interest has been in the chemicals that are in our beauty products. I am trying to gradually switch to organic beauty products and eco-friendly cleaning products. I have contacted a friend, Christy, who owns TaylorMade Aromatherapy about trying some of her organic facial cleansers. I wonder if all the stuff I have been using on my face over the years has actually made my complexion worse instead of making it better! Christy is very knowledgeable about herbs and herbal remedies. She grows her own products right here in the Shenandoah Valley (on a nice secluded, wooded 7 acre lot!). Check out her website and her blog for more info on organic products. I am becoming an avid recycler but also I am more aware of decreasing waste in general. I have been trying to make my motto “Use it up. Wear it out. Make do. Do without.” If you are interested in learning about recycling, check out Earth 911 or Do Something for information. Here’s a tidbit of info for you. Did you know that the US leads the world in trash production each year? We produce about 1609 POUNDS of trash PER PERSON every year! That is insane! Good: Recycle your plastic grocery bags. Lots of stores have recycling bins now–Walmart, Food Lion, Martin’s. It’s easy to do. Just return your bags the next time you go there. Even better: Invest in a few canvas bags for your shopping. Target has some that fold up and fit right in your purse. Martin’s has them right there at the checkout. I have picked up a few from the thift store. They don’t have to be fancy. Just plain old reuseable canvas bags. Another idea is to search consignment stores, thrift stores, and/or yard sales when you are looking for something. You can also join Freecycle. Find your local group and join and you will be amazed at the things that people are giving away for free! You can list things that you want to give away as well. I have a few things in mind that may be listed if they don’t sale at our yard sale (which I seriously need to get to planning!). I get e-mails everyday from people giving things away–Christmas trees, mulch, all kinds of stuff. So I’ll get off my soapbox for today. I do have a neat thing to share about my thrift store experience yesterday. I’ll share a photo later. I got a lot of stuff really cheap! I’m Back in the Saddle aga-yeah-yea-in . . . I had to title this post that because my hubby told me to. So there ya go Aaron. for only $10 and I earned $10 back in ECBs! So basically all this stuff was free! FREE people! You have to start CVSing NOW if you haven’t already! I used $4 worth of coupons on the diapers. I had a $3 off $15 purchase CVS coupon and the fingernail polish and candy was on 75% off clearance. The deodorants are buy one for $4.99 and earn $4.99 back in ECBs for the month of May and the limit is 5–so I will be buying more of those next week! And if you have a second, read this cool story at Handprints on the Wall. A very frugal family of 7 that lives on $300 worth of groceries a YEAR. Yes, I said a YEAR! It is a neat story. Just a few cool things I want to mention. Here are a few of my favorite blogs at the moment. 1. Emily: I stop by Em’s blog just about every day. She is a scrapbooker and just an all around cool chick. And her little girls are absolutely adorable! 2. Sara: I found this blog from Emily’s blog and have literally spent over an hour pouring over it. She and her hubby and daughter are currently touring the US on “The Live Lightly” tour. They sold their home, renovated an RV and travel from city to city teaching people about simple living–oh, and the RV is powered by recycled cooking oil!!!! She is also a Christian and has entries about loving the poor, helping the homeless, and being good stewards of God’s blessings. Another cool chick! 3. Green Lite Bites: I read this author’s other blog, Weight Watchen daily and I love her food blog as well. There is a cool recipe using Ramen Noodles–I had no idea they are available in a low fat version now! 4. Elsie : Another scrapbooker but her blog is full of all kinds of wonderful goodness. She has an interesting style and I love looking at her photos! And here are a few of my current favorite things. If I was Oprah, I’d give you all one of each! 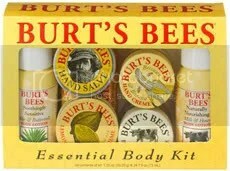 I bought this exact same kit at Kate’s Natural Foods (they also have it at Martin’s grocery store for the same price). I have never tried much of the Burt’s stuff but I am in love and am a lifelong fan. I love the way it all smells. Lots of natural goodness. I love the lemon cuticle cream, the peppermint soap, all of it smells delicious! If you don’t have an mp3 player or iPod yet, consider getting one of these! Target carries them for a reasonable price (less than $40). I have the black one and Annagrace has the pink one and we love them! They are very easy to use and are incredibly small and lightweight. Not quite as small as the iPod shuffle, but close! I got this bike from Walmart and Aaron got the men’s version in red! It is a nice, affordable and comfortable bicycle! 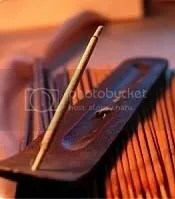 I have always loved incense. I found some recently at Kate’s Natural Foods and it is very rich. Yum. I love to smell it burning. I can’t believe I’m going to post this. It is quite embarassing. So Aaron and I have talked a lot lately about stewardship, reducing, reusing and recycling, not being wasteful, etc. And we’ve made some positive changes. Today was our first family trip to the recycling center. We had lots of plastic bottles and newspapers to drop off. I felt good about it. We have both noticed that our outgoing trash is much, much less than in previous months. Here lately we have talked a lot about clutter. And about SIMPLIFYING our lives. We have too much clutter. I confess, dare I say it for Aaron to read, that more of the clutter in our house is mine and the girls than it is his. However, he does contribute to it in some way. I would die if people saw our bedroom right now, or our dormers, or even the office! So we are going to be decluttering our lives. It’s exciting really–getting rid of stuff we don’t need and NOT filling it up with more things that we don’t need! 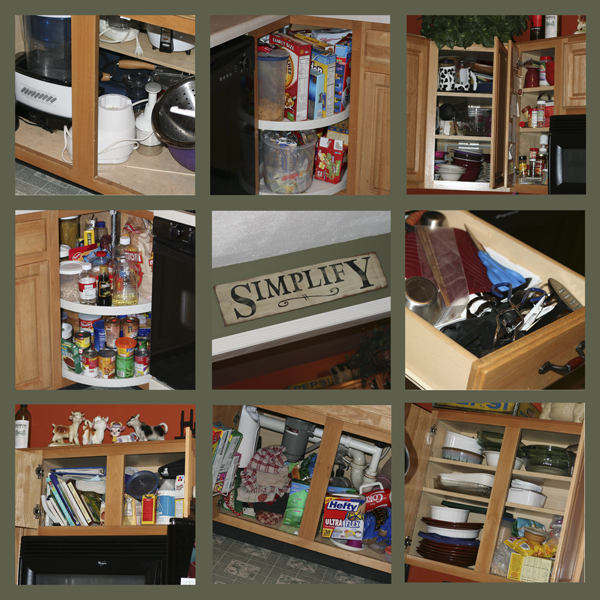 Our kitchen is a perfect size for us–any bigger and I’d never keep it clean–but we are lacking in cabinet space. Well, I think we are. I don’t really know because we just have too much stuff! I was looking in the cabinets tonight (taking ‘inventory’) and was thinking, “do I really need 4 pyrex casserole dishes?” No, I don’t. I don’t cook that much anyway and really I can make do with one, maybe two just in case. So my first decluttering project is going to start in the kitchen. We are getting a new kitchen floor soon–I can not wait!!! !–so this is a good time to get it all cleaned up. I am going to turn it upside down. Everything in every cabinet is coming OUT and hopefully lots of it will be heading to the garage sale pile. I took before photos and hopefully by next week this time, I will be posting after photos. So without further ado, here are my very embarassing photos! Simplify. Ahhhh . . . sounds so refreshing.